I was eminently qualified for the position of firefighter by virtue of the many times I was cited for meritorious conduct during my career until I suffered a disabling Line of Duty injury, which led to me being deemed medically disqualified from the performance of my duties by the City of Baltimore. I was assigned to Truck Company 1, Oldtown Station, which covers the lower eastside business district in downtown Baltimore City. Truck Company 1 is consistently ranked among the busiest Truck Companies in Baltimore, responding to over 3,000 calls for service every year. If probative evidence is required to be introduced, the injury report would be essential. Why this was withheld has never been addressed. On May 8, 1997, approximately 7 months after returning to duty , I experienced another episode of back pain. Out of an abundance of caution, with respect to the injury that occurred just prior to this, I sought the care of my doctor, who placed me off duty for 4 days due to what was diagnosed as a mild muscle strain. I continued with the full performance of my duties for 2 years after that until I suffered a recurrence of that injury and was deemed to be medically disqualified from the performance of my duties by the City of Baltimore in 1999, as a direct and proximate cause of the Line of Duty injury that had occurred on August 2, 1996. NFPA 1582 Standard on Medical Requirements, 1992 Edition or later revision shall be used as a guideline for clinical judgment of physical and medical suitability of public safety personnel, both prospective and incumbent. 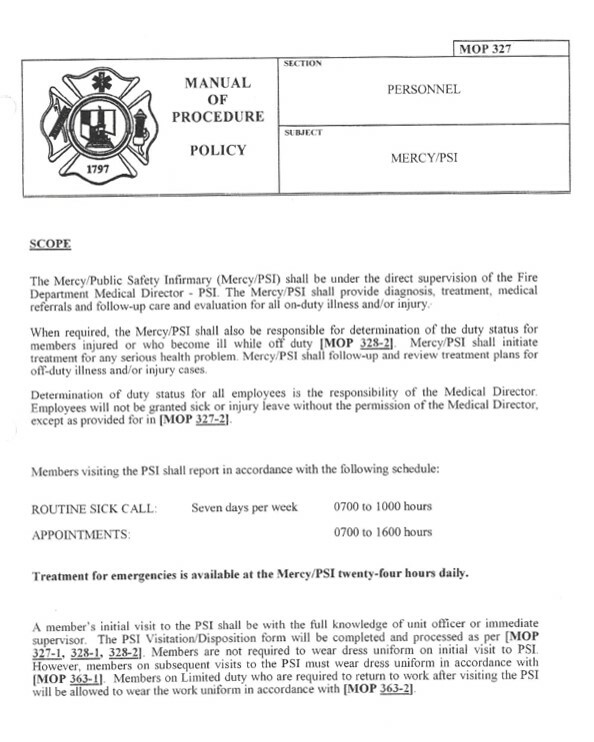 As the policies of the Baltimore City Fire Department grants the Medical Director for the City full discretion over the duty status of any member returning to duty following a line of duty injury, members are ordered by the Chief of Fire Department to file an application for disability retirement benefits from the Fire and Police Employees Retirement System of Baltimore City. Pursuant to the Baltimore City Code, Article 22, a hearing was conducted before the Panel of Hearing Examiners for the Fire and Police Employees Retirement System of Baltimore City to determine eligibility for Special Line of Duty disability retirement benefits. The medical file was submitted by the City of Baltimore to the Fire and Police Employees Retirement System of Baltimore City and presented, as the record before the Panel of Hearing Examiners for that administrative hearing. The Fire and Police Employees Retirement System of Baltimore City was represented by the Baltimore City Solicitor. I was represented by private counsel. Determination of the duty status for all employees is the responsibility of the Medical Director. (d) Allowance on non-line-of-duty disability retirement. 2. 2% of his average final compensation for each year thereafter. At the conclusion of that administrative hearing, the hearing examiner ruled that I was disabled from the further performance of my duties, however, the hearing examiner failed to rule on the evidence presented in the record and made a critical error that did not support his findings of fact. I was awarded an Ordinary Disability pension, which is reflective of this injury not occurring in the Line of Duty and is significantly less than the Special Line of Duty Retirement Benefit, despite being qualified for the full Special Line of Duty Disability Retirement Benefit. I appealed the arbitrary and capricious determination, however, before the appeal could be heard by the Circuit Court, the City of Baltimore reinstated me to the full performance of my duties in January of 2001. As evidence clearly shows, the injury the hearing examiner is referring to occurred not in 1999, as he states in his decision, but in 1997. There is no evidence contained in the evidence or any testimony provided that demonstrates that any injury occurred on May 8, 1999, as I was already off duty since March 23, 1999 with a recurrence of the injury that occurred while I was working. I continued with the full performance of my duties until I experienced another episode of back pain that caused me to seek medical treatment again in June of 2002. It was found that the narrowing of the vertebral disc space that was evident in the occurrence of the original surgery had progressed to the point that surgical intervention would be required. It was again determined by the City of Baltimore that I would be retired due to the injury. Despite settled Maryland Law on the issue of the causation of work-related injuries, the City of Baltimore incorrectly classified this as a Non-Line of Duty injury. I grieved this erroneous determination with my Union representative. I was informed that the grievance was rejected due to my status reflecting that I was being medically disqualified from the further performance of my duties. I was again ordered to apply for Special Disability Retirement Benefits from the Fire and Police Employees Retirement System of Baltimore City and was determined to be “not disabled from the further performance of the duties of a firefighter” and all benefits were denied again by the same hearing examiner who issued the prior denial in error.